People of faith should show "extreme confidence" in God after terror attacks such as the 7 July bombings, the Archbishop of Canterbury has said. 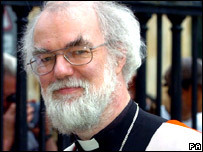 In a Sunday sermon at York Minster, Dr Rowan Williams said this would combat "extremists of murder and fear". He said the pain of last July's London bombings, which claimed 52 lives, was still deeply felt. The first anniversary of the attacks was marked on Friday with a two-minute silence and the laying of flowers. Dr Williams said: "For the person who resorts to random killing in order to promote the honour of God or the supposed cause of justice it is clear that God is too weak to be trusted. "God is too weak to look after his own honour and we are the strong ones who must step in to help him. Such is the underlying blasphemy at work." He added: "What we need is that people in all communities of faith do not seek to fill the void in their souls by feverish language and action that is blind to the reality of others. "It is people who are extreme in their confidence in God who will most effectively challenge the extremists of murder and fear." The archbishop called on people of faith to come to terms with the "horrible fact" that there were those who wanted to serve their God by "organised slaughter and suicide". Friday's anniversary of the bombings culminated in a service of remembrance at London's Regent's Park. A 300-page book filled with tributes to those killed in the attacks has gone on permanent display in London. The pictures, words and poems have been produced by relatives of many of those killed.